There was a time, five years ago to be precise, when I absolutely loved crab cakes and can honestly say it’s one of the very few dishes I actually “missed” going vegetarian. Amidst the virtual sea of meatless “crab” cake recipes out there I have finally hit on one that seriously delivers. These cakes have all the texture and flavor you remember, without harming a single crab. 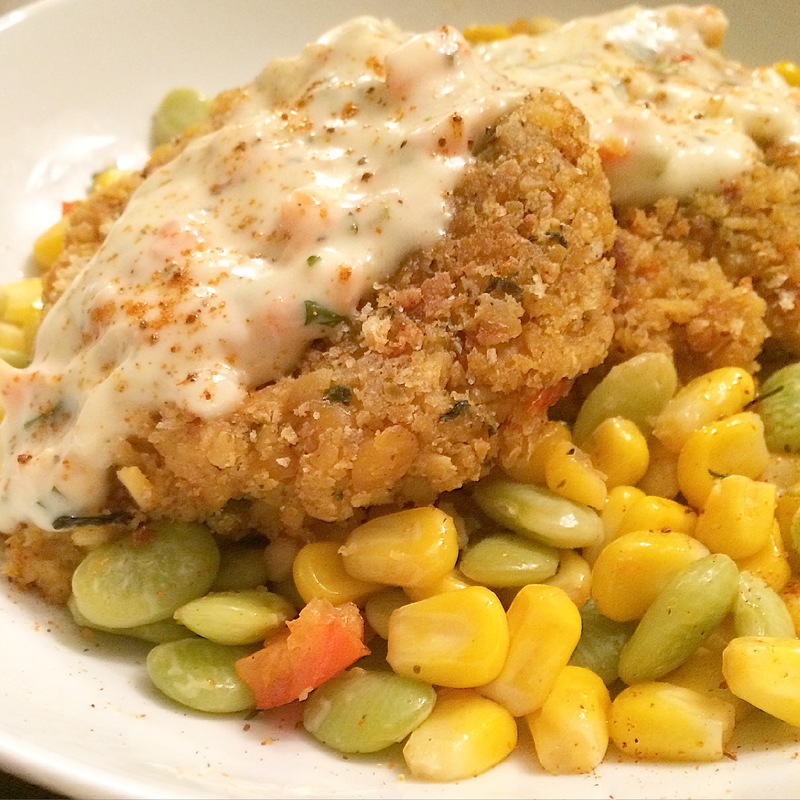 Serve over succotash and top with remoulade sauce. Using a steamer basket, steam the tempeh for 25 minutes, then set aside to cool. Add chickpeas to a food processor and pulse until rough chopped. Be careful to not overdo it here; you want to retain the texture of a real crab cake. Scrape chopped chickpeas into a large mixing bowl. Add the onion, bell pepper, and celery to the food processor. Pulse until finely diced. Heat 2 teaspoons olive oil in a large pan over medium heat. Add onions, celery, red pepper, and salt. Cook, stirring frequently, 8 minutes, or until onion are tender. Set aside to cool. Crumble the tempeh into a large mixing bowl. Add the cooked veggies, 1/2 cup of the bread crumbs, 1/2 Tablespoon (1 1/2 tsp.) Old Bay, mayonnaise, chickpeas, capers, parsley, lemon juice, mustard, kelp powder, a few dashes of cayenne pepper sauce, and a few twists of salt and pepper. Using your hands, mash everything together. Divide the mixture into 8 small patties. Combine the remaining 1/2 cup breadcrumbs with the remaining 1/2 Tablespoon (1 1/2 teaspoons) Old Bay in a bowl. In a large pan, heat 2 Tablespoons olive oil over medium-high heat. Dredge each cake in the bread crumb mixture and place them in the pan to cook for 3-5 minutes, or until lightly browned. Flip over and brown the other side. Drain on a paper towel-lined plate and sprinkle with a little extra Old Bay. To serve, place on top of succotash and top with remoulade. I love crab cakes too and having a vegetarian option is fantastic! Also a food processor is huge when it comes to preparing food like this, makes it better in my mind! I’m not really a fan of sea food but my brother who is also a chef. Passing this unique recipe to him, thanks for sharing!! Thanks! I hope he enjoys it! I am a total lover of seafood and this dish looks so delish! I definitely want to try this and the vegan take on this is great! This is what I make when I’m craving that crab flavor! This looks good! And I already have most of the ingredients, I bet my husband will love this one!! Vegan Crabby Cake sounds deliciously awesome! I haven’t tried crab cake but I am going to definitely try this recipe as it looks extremely easy and yum! I’ve never had vegan crabby cakes before! That’s definitely something that I would love to try and make for me and my husband! I think this is a great recipe! I think I would miss out on crab cakes if I were to go vegan for sure. Although I am always up for trying something different and it does sound really good. I will have to try this out. This looks delicious. I will try it! Great recipe, I will get this done and tried! My family will love it!